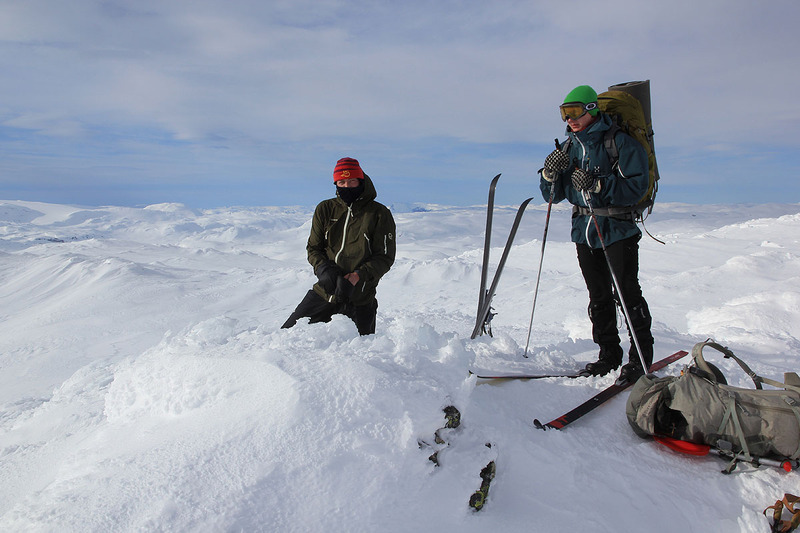 This trip was part of a skiing trip along the top of the large mountain Hallingskarvet. A good starting point is the railroad station Finse, the highest station on the Oslo to Bergen railraod at 1222 meter. There is no road to Finse, so taking the train is your only option. 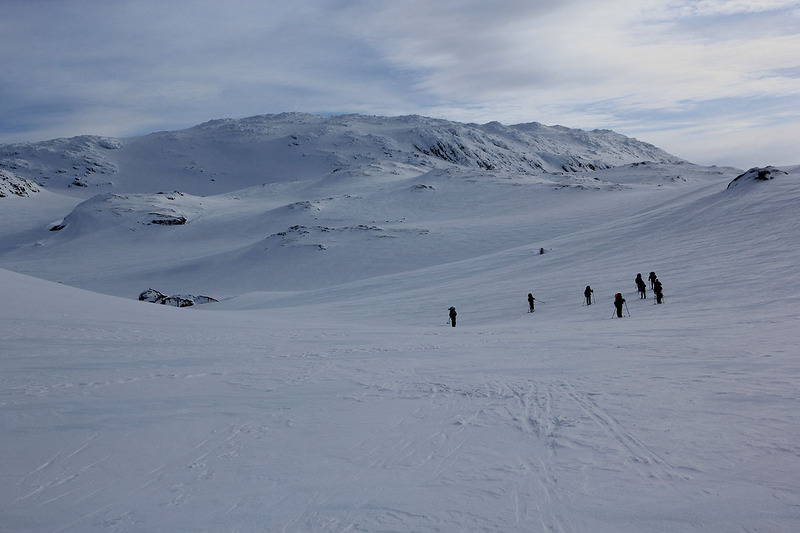 From Finse, ski uphill towards the col Kyrkjedøri, this is east of the lake Flakavatnet. As you pass the small lake that are just below 1500 meter of elevation (south-east of point 1564), leave the summer route and head more east near point 1575, then more north up into the col just east of point 1689. Ski just beyond the saddle, then a bit steepish to your right and gain easier terrain as you climb east and more south-east towards the 1816 meter local summit on the plateau. Continue south-east and follow high ground as you descend to a north-south saddle just before Hellevassfonni. 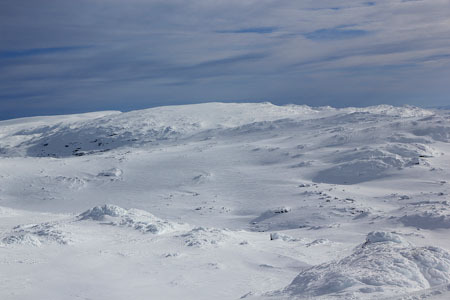 Note that this route runs south of summit 1827, the first independent summit on Hallingskarvet. Climb it if you have the time and chance! Hellevassfonni is the second independent summit along this route. The view from this summit is exceptional. You see Hurrungane and Jotunheimen to the north, then Gaustatoppen and Hårteigen south. Hardangerjøklen is another fine view in the direction back to Finse. This route description continues across Folarskardnuten. This was a trip organized by the Bergen Mountaineering Club (DNT Fjellsport i Bergen Turlag). We travelled by train after work on Friday, arrived after dark and skied about one kilometer only. We were 10 altogether and with 3 tents the group had a comfortable night. The next morning we left shortly after 0900 and (after several short stops), arrived at the top of Hellevassfonni around 1430. The skiing condition was exceptionally bad. Unseasonably mild weather had caused rain to fall even at this elevation. Subsequently, this had frozen and formed a very icy and somewhat rough surface. Klister could not be used due to cold powder snow in between the icy patches. Normal ski wax would wear off almost instantly. I visited the 1816 summit along the way, believing that this was the first independent (P100) summit on Hallingskarvet. Unfortunately, I failed to recognize the 1827 top that we skied right by. Thus, I am still missing an 1800 meter, independent summit on Hallingskarvet. Panorama north, from Hurrungane and Jotunheimen towards the east.